Phablets – large smartphones with screen sizes between five and seven inches – have become very common in the market. 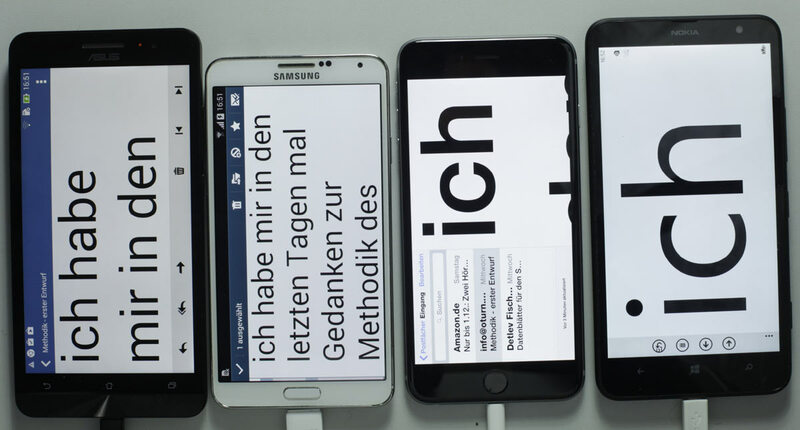 Phablets are particularly interesting for low vision users because they offer a much larger display area than smaller smartphones. 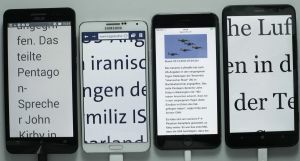 When reading web or eBook content, more words per line will be displayed on a phablet when the text size is cranked up high - particularly in landscape orientation. 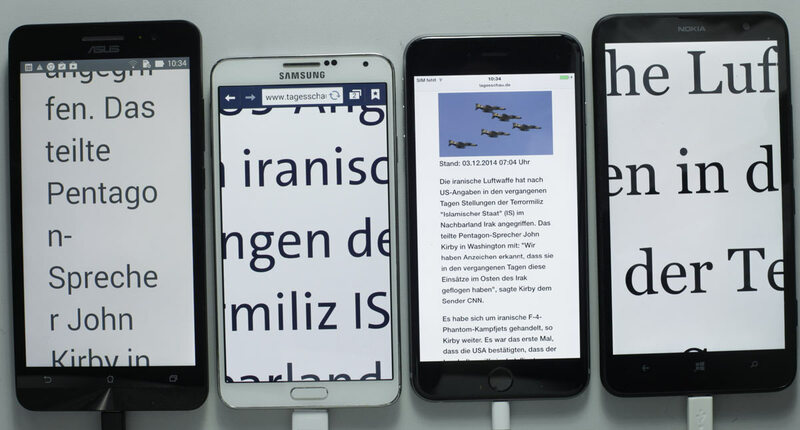 This means that text may still be legible at sizes of around 30-40 pt. And when using zoom at any given magnification scale, more context will fit into the enlarged section than on a smaller screen. 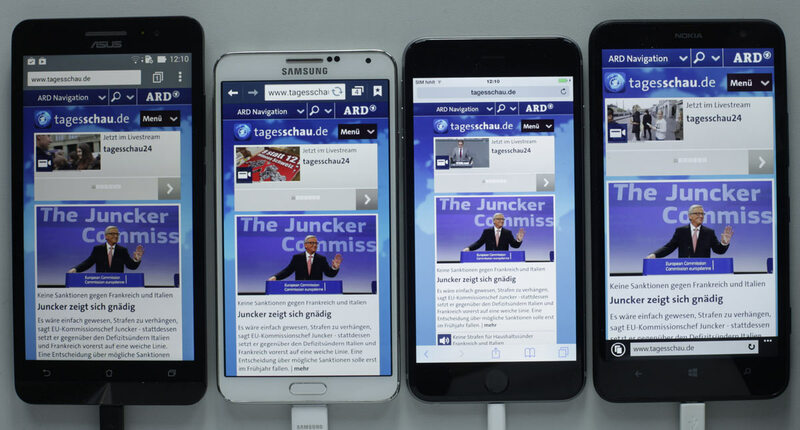 Phablets can be quite expensive - especially Apple’s iPhone 6 plus which costs about €700 without contract. But other models have appeared that quite affordable. The cheapest phablet in our test, the six-inch Nokia 1320, costs about €220, the Asus Zenfone 6 costs about €300. What did we test, and how? Google’s Nexus 6 phablet (built by Motorola) would have been an obvious contender as a representative of unfettered 'Vanilla' Android, but it was not available to us at the time of testing. 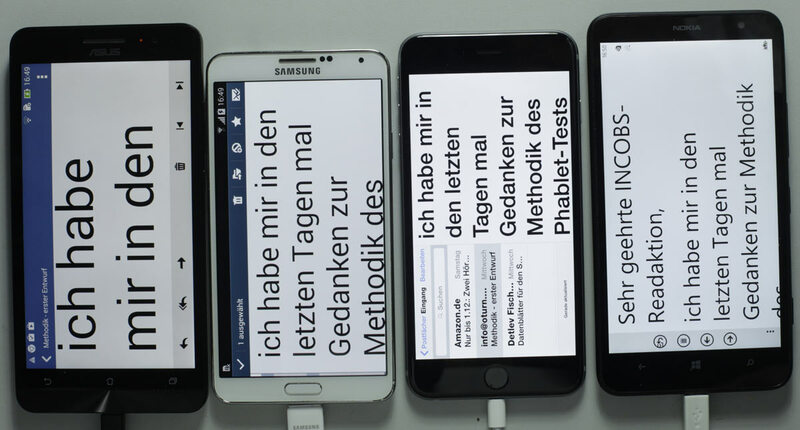 In our test, we have excluded aspects common for all users regardless of vison impairment, such as call quality or performance, and focused on aspects that are important for long-sighted and low vision users. 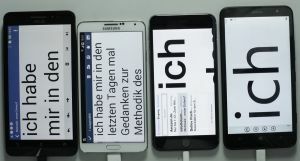 The test included general features (physical characteristics, screen) functional categories (e.g., the quality of built-in assistive technologies like zoom magnification, contrast views, and to a lesser extent the screen reader), and content categories including important default apps. Here, we looked at important criteria like default text size, text resiziability, contrast, or the availability of accessible names for controls. 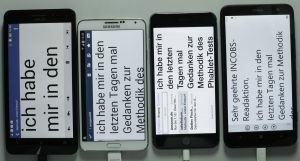 In our test, we rated devices in thirteen categories that are relevant for low vision users (for details, see our mobile devices technical review methodology). The focus on these categories does not imply that other aspects (e.g. the accessibility of other apps or the use of peripherals like Bluetooth keyboards) are negligible. The practical usability of a device for a particular user depends largely on the availability and accessibility of features that he or she actually needs. A user who rarely browses the web but reads mails, makes calls and uses SMS might not care that the default browser has particular deficiencies (such as insufficient text resizeability in the reader mode, as on the Lumia 1320). Obviously, many users will fall somewhere between these groups. Also, some special conditions like colour blindness are not explicitly reflected in this test. Readers should compare devices according to those sections that are particularly important to them. For more details, please check out our mobile devices techncal review methodology. Detailed results for the thirteen categories can be found in the separate posting Phablets for low-vision and long-sighted users - the details. Home screens. 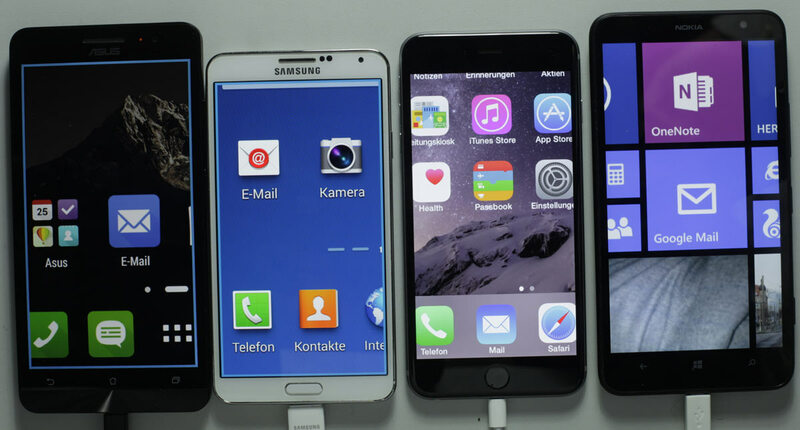 From left to right: Asus Zenfone 6, Samsung Galaxy Note 3, Apple iPhone 6 plus, and Nokia Lumia 1320. There are important differences regarding configuration options. The Asus and Samsung phablets running Android skins offer a combination of icons and widgets that can be freely positioned. In contrast, the iPhone orders all icons as a grid, there are no widgets. Windows Phone has tiles that users can resize and position at will. 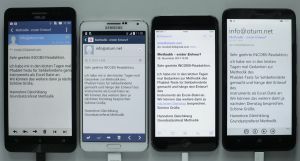 This view shows default browsers in comparison with a text column (reader mode off) magnified so it can still be read without horizontal scrolling. 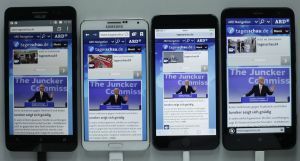 From left to right: Asus Zenfone 6, Samsung Galaxy Note 3, Apple iPhone 6 plus, and Nokia Lumia 1320. 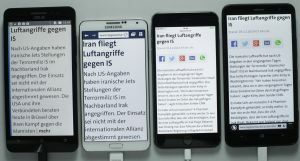 This comparison shows an article form Tagesschau, a news website, in reader mode with default settings. 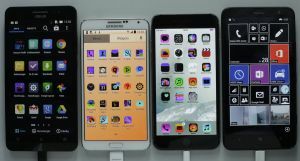 From left to right: Asus Zenfone 6, Samsung Galaxy Note 3, Apple iPhone 6 plus, and Nokia Lumia 1320. The view shows the reader mode of the default browser with a usable zoom factor. 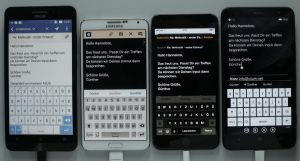 From left to right: Asus Zenfone 6, Samsung Galaxy Note 3, Apple iPhone 6 plus, and Nokia Lumia 1320. This comparison shows the rendering of the Tagesschau start page in the default browsers. 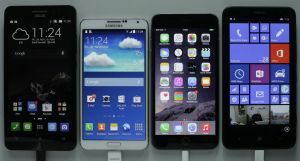 From left to right: Asus Zenfone 6, Samsung Galaxy Note 3, Apple iPhone 6 plus, and Nokia Lumia 1320. The comparison of dial pads shows contrast problems smallest numbers, and tiny letters on the iPhone dial pad. 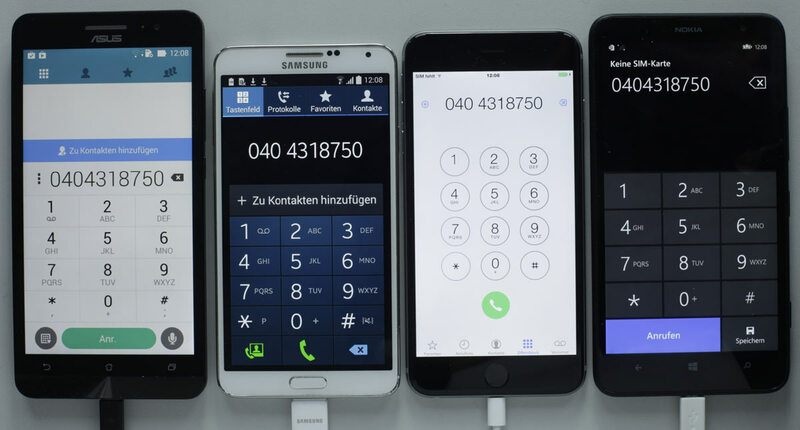 From left to right: Asus Zenfone 6, Samsung Galaxy Note 3, Apple iPhone 6 plus, and Nokia Lumia 1320. The comparison shows the default view of a received mail in der default mail app. 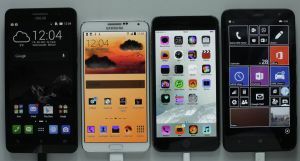 From left to right: Asus Zenfone 6, Samsung Galaxy Note 3, Apple iPhone 6 plus, and Nokia Lumia 1320. The comparison shows the home screens at about 200% zoom magnification. 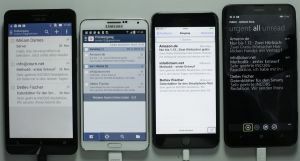 From left to right: Asus Zenfone 6, Samsung Galaxy Note 3, Apple iPhone 6 plus, and Nokia Lumia 1320. The home screens with maximum zoom magnification - just the mail icon is visible. The iPhone offers a factor of 15 but this is hardly usable. From left to right: Asus Zenfone 6, Samsung Galaxy Note 3, Apple iPhone 6 plus, and Nokia Lumia 1320. The comparison shows received mails od default apps in the default view. From left to right: Asus Zenfone 6, Samsung Galaxy Note 3, Apple iPhone 6 plus, and Nokia Lumia 1320. The comparison shows a received mail in the default mail app with resized text. 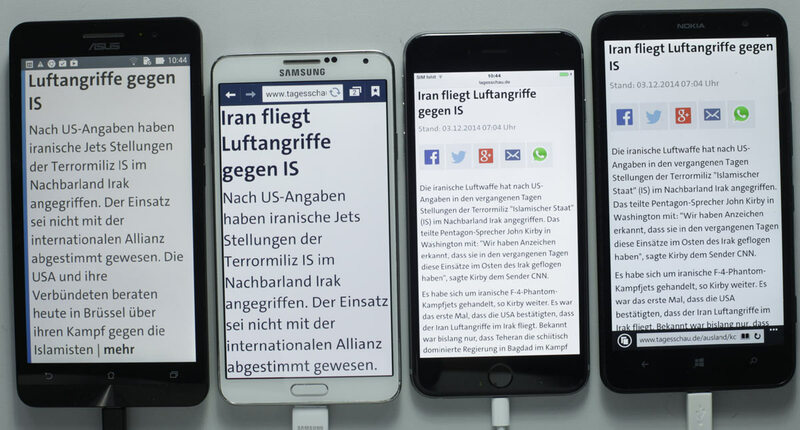 The split view on the iPhone can be toggled to full viewFrom left to right: Asus Zenfone 6, Samsung Galaxy Note 3, Apple iPhone 6 plus, and Nokia Lumia 1320. The same received mail in the default mail app with resized text plus maximum pinch zoom. 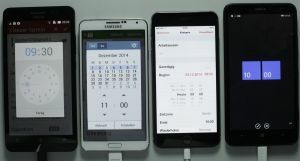 From left to right: Asus Zenfone 6, Samsung Galaxy Note 3, Apple iPhone 6 plus, and Nokia Lumia 1320. The comparison shows the new mail view with the virtual keyboard visible. 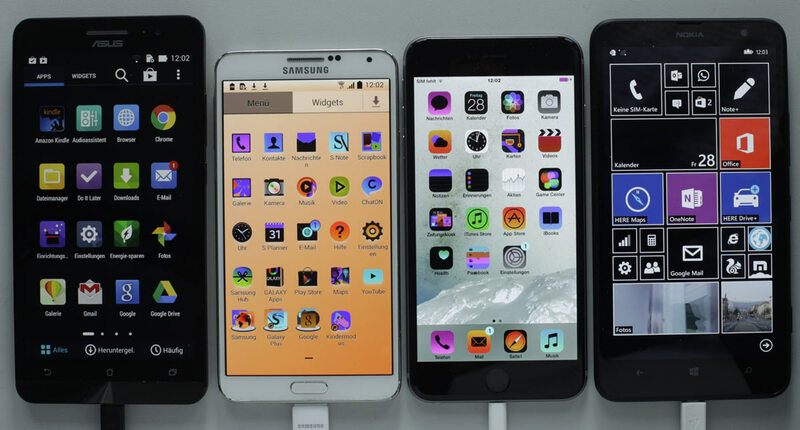 From left to right: Asus Zenfone 6, Samsung Galaxy Note 3, Apple iPhone 6 plus, and Nokia Lumia 1320. The Samsung Phablet defaults to a white on dark-grey keyboard, the Zenfone has the largest keys. The comparison view shows the month grid on the default calendars. 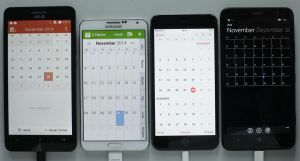 From left to right: Asus Zenfone 6, Samsung Galaxy Note 3, Apple iPhone 6 plus, and Nokia Lumia 1320. Tiny text on the Windows Phone calendar, and hardly bigger on the iPhone. 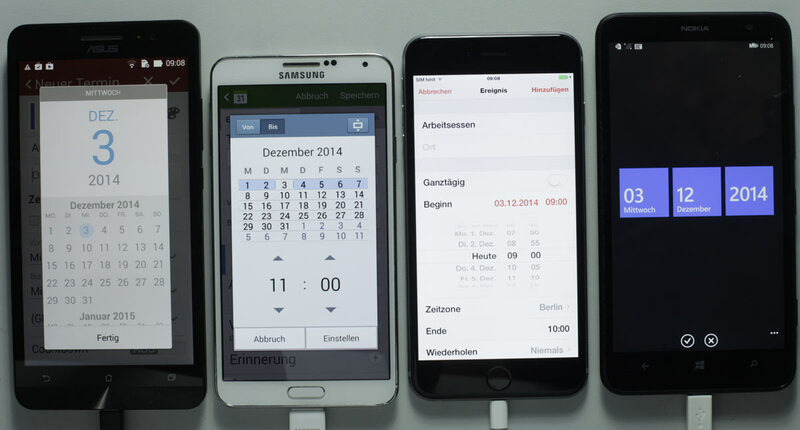 The comparison shows the new event view of the default calendar app. The preselected maximum system text size is not honoured by many elements. 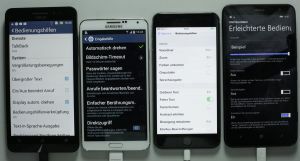 From left to right: Asus Zenfone 6, Samsung Galaxy Note 3, Apple iPhone 6 plus, and Nokia Lumia 1320. 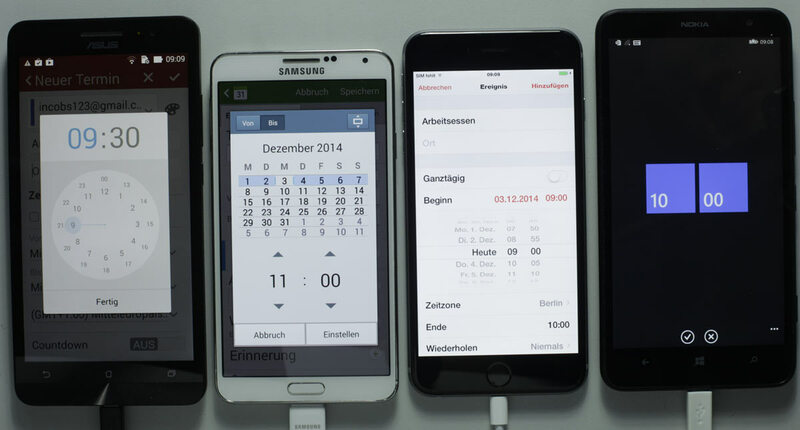 Calendar apps employ different widgets to pick the day for a new event. The simplest is found on the Lumia under Wondows Phone. 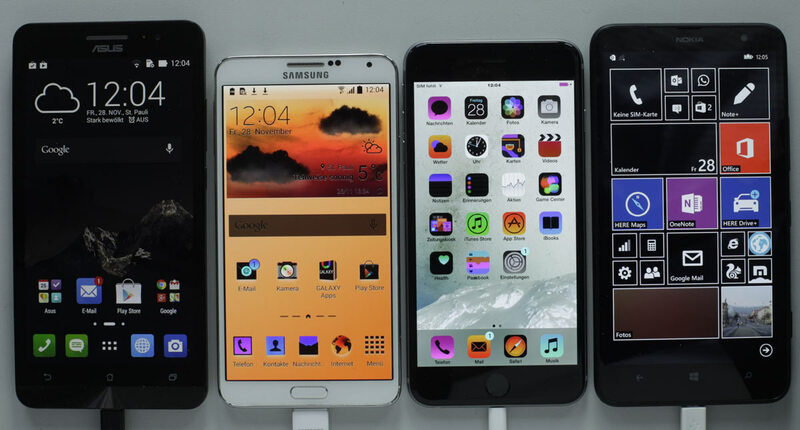 From left to right: Asus Zenfone 6, Samsung Galaxy Note 3, Apple iPhone 6 plus, and Nokia Lumia 1320. Calendars offer different ways for picking the event time. The worst implementation is found on the Asus Zenfone (same as under Vanilla Android). The Lumia keeps it simple, the iPhone combines day and time selection in one jukebox widget. 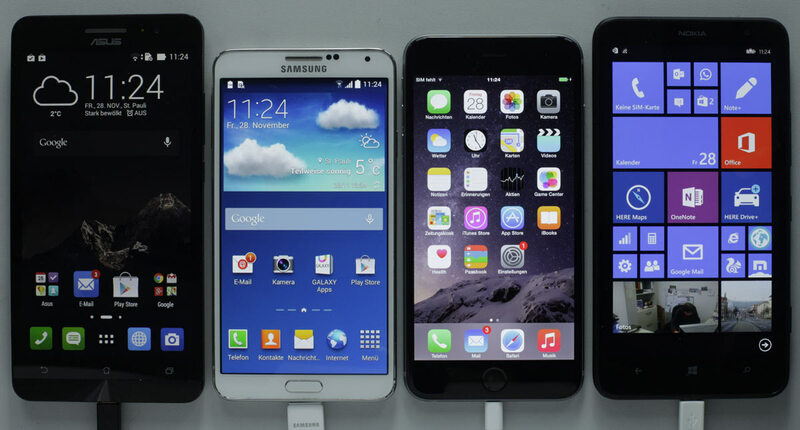 From left to right: Asus Zenfone 6, Samsung Galaxy Note 3, Apple iPhone 6 plus, and Nokia Lumia 1320. For the user group of long-sighted users, the Samsung Galaxy Note 3 comes out on top with a total weighted score of 62%. The Asus Zenfone 6 (58%) takes second place, narrowly beating the iPhone 6 plus (57%). The Nokia Lumia 1230 comes last (55%). Please note that in this group, just seven percentage points separate the best-performing form the lowest-performing phablet. Users should look at their personal preferences to qualify the results. For more details, please refer to the details page. 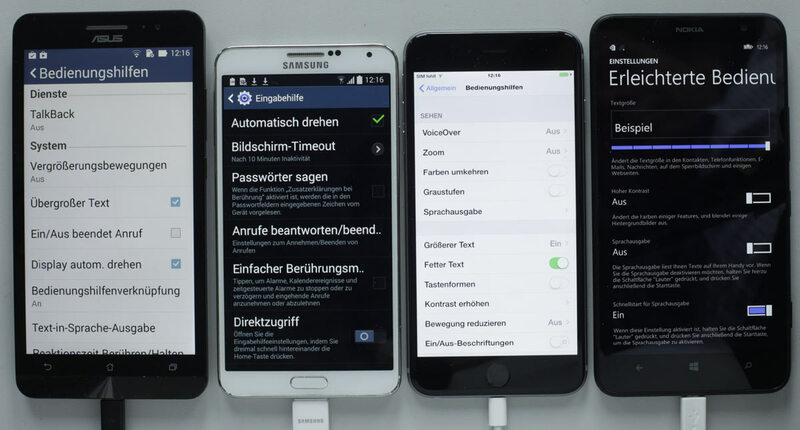 The winner for this user group, the Samsung Galaxy Note 3 has good default text sizes and generally good contrast in settings and important apps like mail and calendar. The screen is bright, and the physical home button is nicer to use than the non-tactile buttons on the Asus and Nokia phablets. The home screen can be configured to a user's liking with icons and widgets that can be freely positioned. The Samsung skin TouchWiz offers a simple mode for those needing enlarged home screen icons and labels. System text can be resized well; sometimes text can also be resized within apps (as in the mail client).The Galaxy Note also has a better default calendar than its Android sibling with the Asus skin. The default browser has a good reader mode that has a night mode (while on black text with images that remain uninverted) and allows the strong magnification of text with text reflow. Voice input is not as good as on the iPhone, but acceptable. A Speak Screen function is absent. The Asus Zenfone 6 has the best default browser of the four phablets tested. The home screen is as configurable as on the Samsung phablet. The Asus Phablet also has the largest icons and labels in the simple mode. The virtual keyboard is visually the best with large and contrasty keys and word suggestions (even though the key characters could be bigger). But there are also a few drawbacks. The screen could be a lot brighter. There is no dedicated contrast mode, not even the colour inversion found on the Android sibling from Samsung (note however that the default browser offers its own inverted colour setting.) The calendar has a time setting widget with tiny elements and poor contrast that seems to be the same as in the Vanilla Android calendar. Voice recognition quality is just average (same as on the Samsung phablet), and there is no Speak Screen function. 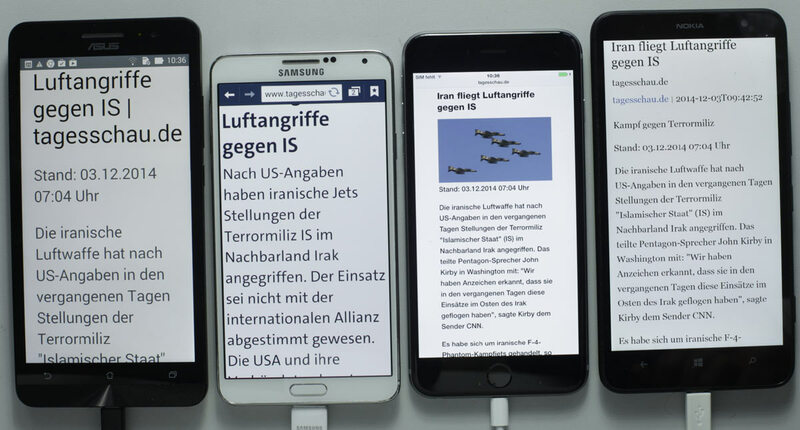 The strongest points of the Apple iPhone 6 plus are not so apparent in this user group of long-sighted users where the strength of its built-in assistive functions - zoom and screen reader - is not taken into account. The iPhone's screen is exceptionally bright, and the button layout and the tactile home button are the most convincing. The iPhone offers quite good text sizes in places where the system text size setting is honored, as in the mail body and new mail text, and a reader mode in the default browser Safari that allows good text scaling (but no night mode). The voice input via Siri easily beats the competition in terms of recognition quality, spelling, punctuation, and capitalisation. And there is an easy-to-use Speak Screen function for users unfamiliar with the screenreader, which can be a real benefit and is not offered by the competition. Drawbacks are the lack of configurability of the home screen and the lack of a simple mode; small default text sizes combined with the fact that many important text-based controls are unaffected by system text resizing and stay small; the worst dial pad; many elements with insufficient contrast; and - as we talk contrast - the lack of a dedicated strong contrast mode. The Nokia Lumia 1320 has benefits when good contrast and good default text size in settings and core apps like mail is considered important. It is also the ony device which has a dedicated strong contrast mode. The home screen can be nicely customised by arranging app tiles at the desired size and position. There are a number of drawbacks, however, which explain the lower ranking. The default browser Internet Explorer has a poor reader that offers text in a small default text size that cannot be increased with a reflow of text. There are some browser alternatives for this platform that may have a better reader. The Windows Phone calendar disappoints with its tiny dates in the month grid view and small labels in the event view. Voice input is sub-par: it doesn not offer input for longer than about 10 seconds (this may be different with higher spec hardware as in the Lumia 1520 phablet). And there is no Speak Screen function. We assume that users in this group need much larger text and good contrast. System font settings are usually not sufficient to arrive at the font sizes needed, so this group makes use of the built-in zoom function. 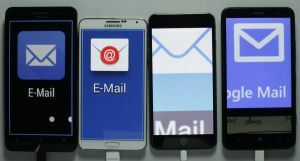 Users in this group are not familiar with the device's screen reader and the changed navigation paradigm that sets in once the screen reader is started. Where available (currently only on the iPhone), they benefit from a speak screen function. When browsing the web, these users make heavy use of the reader mode with enlarged text. In this user group, the iPhone 6 plus wins (66%), followed by the Samsung Galaxy Note 3 (55%). The Asus Zenfone takes third position (53%) and the Nokia Lumia comes in last (41%). In this user group, where zoom is indispensible for operation and therefore accounts for 20% in the overall weighting of categories, Apple's iPhone 6 plus beats the competition. It is not just that iOS has features that the competition is lacking: We have given low weight to the option of displaying a permanently visible zoom control element since its utility for low vision users still needs to be established in user testing. The fact that iOS offers a zoom factor of up to 15x is also not decisive - there will be few situations where such a level of magnification would be useful and still usable on a phablet. 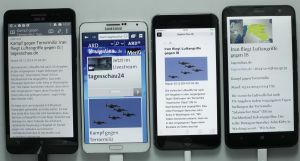 A big advantage however is that users can decide whether the virtual keyboard stays small when zooming (as with Android) or is enlarged as well (as with Windows Phone). Both options are critical: For some users, the virtual keyboard is simply too small to use unmagnified, for others, keeping it small offers much easier touch input since no panning is necessary. Other iPhone advantages already noted and useful for low vision zoom users are the physical characteristics (brightest screen, haptic home button), the speak screen function, and the best speech input. It is worth noting that quite a few things warrant improvement. Many text elements in apps cannot be magnified via system text size settings, there is no dedicated contrast mode, and in the apps tested, the contrast of many elements (buttons, labels, placeholder text) was not sufficient. As far as text size, home screen configurability and browser and mail apps are concerned, the Samsung's Galaxy Note 3 still has the edge, but arguably, Apple's superior zoom function and the availability of the speak screen function mean that it comes in second place in this user group. Again, user needs differ. Users should therefore check for themselves in the details page what categories are most important to them. 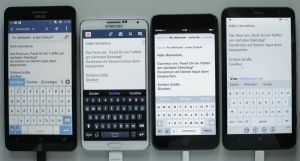 Those users who always want their virtual keyboard unmagnified and don't care for the speak screen function may find the Samsung Galaxy Note 3 (or the similar more recent model, the Galaxy Note 4) preferable to the iPhone 6 plus. The reasons for the lower ranking of Asus' Zenfone 6 are similar to those noted for the Samsung Galaxy Note 3. Regarding the zoom function, both Android phablets are practically identical and perform worse than the iPhone (apart from Android's spot zoom function). Compared to the Galaxy Note, the Zenfone's text resizing options are fewer, the screen is less bright, and the physical characteristics (no haptic home button) are less suitable for low vision users. Those zoom users who like their virtual keyboard to stay small, can live with the calendar (or replace it with another one) and do not care for a speak screen function may find a few things to like in this bargain-priced phablet: The best default browser, a decent mail client, a configurable start screen with a good simple mode, a good virtual keyboard (but only for visual use!) and good-enough speech input. Zoom users suspecting they may eventually need the screenreader should avoid the Zenfone, though - the virtual keyboard is not TalkBack-accessible. There are a few things that Nokia's Lumia 1320 (or rather Windows Phone) does quite well: The simple tile interface of the start screen and the large text in system settings, as well as the strong contrast mode. Getting to things that matter particularly for low vision users like zoom magnification, however, Windows Phone is disappointing and clearly performs worse than Android and iOS. The gestural input seems more sluggish and is at times unresponsive, and calling up new views usually means a re-orientation (shifting the magnified section across seas of white or black, or zooming out and in again). The characters on the virtual keyboard are inexplicably small, speech input is worse than of the competition, and the default apps have issues. For example, Internet Explorer's reader mode lacks text magnification, and the calendar has tiny fonts and inputs only labelled by low contrast placeholders. This third group consists of zoom magnification users who use the screen reader in addition, for example, where content is not readable at a given zoom factor or when longer passages of text would be too burdensome to read (for example, because they would require constant horizontal scrolling). As use of the screen reader is often intermittent, it is particularly important to be able to turn it on and off easily, preferably by pressing some hardware button. 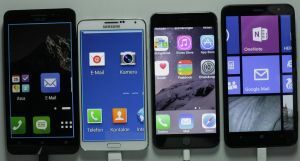 In this group, the clear winner is again the iPhone 6 plus (73%), followed by the Galaxy Note 3 (58%), the Zenfone 6 (51%) and the Lumia 1320 (46%). Note that in this test we just considered the overall performance of the screen reader as one feature to be ranked, and the ease of turning it on and off as a second feature. When comparing screenreaders used by non-visual users as sole means of interaction, a more fine-grained test will be necessary. 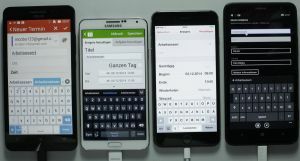 For this user group, the existence of accessible naming of controls in the categories covering the default apps and the virtual keyboard is now weighted and therefore has an impact on the overall category result. Not surprisingly, Apple's iPhone 6 plus also comes out on top for low vision users making use of the zoom function and the screen reader. In this group, the built-in zoom adds 20%, and the screen reader 12% to the overall weighting of categories. Both functions are strong points. The iPhone is actually the only device in the test that provides a workable experience when using zoom and screen reader together. When the screen reader is on, swiping gestures move the focus to the next focusable element (such as a link in a browser or a text input in an app). When looking at just a small portion of the screen in zoom magnification, it is vital that the focus movement also updates the content of the visible magnified section. We should note, however, that under iOS 8, VoiceOver seems buggy when using Safari to browse the web. We do not know if and when these problems will be evened out in a future OS update. 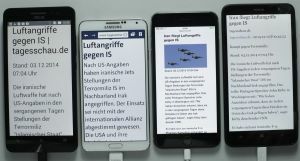 On the Samsung's Galaxy Note 3, the zoom function and the screen reader TalkBack can be used toghether, but they are not integrated as on the iPhone. When TalkBack is turned on, moving the focus by swiping does not reposition the magnified section. Other disadvantages of the Galaxy Note were already covered for group 2 (zoom users not using the screenreader): the virtual keyboard cannot be magnified, and there is no speak screen function. The typing experience on the virtual keyboard with TalkBack turned on is also sub-par: users select keys by touch-explore and then type by double-tapping. The direct touch typing method of vanilla Android ,where a character is typed when lifting the finger off the key is not available. The Asus Zenfone 6 (or rather, the Asus skin Zen UI) has a big problem that make the device for low vision users who rely on the screen reader pretty unusable: The virtual keyboard does not provide accessible names to the screen reader TalkBack when exploring the screen with the finger. This means, keys can really only be selected visually. Keys are spoken once typed, but trial and error is not workable solution if you depend on the screen reader. Since the Android virtual keyboard is one of the one thing that is not magnified when zooming in, screen reader support would be all the more important. Other issues have been described for group 2 (zoom users not using the screenreader). Nokia's Lumia 1320 is plainly not suitable for this user group. There is not only a lack of integration between zoom and screen reader as on Android: the two functions just cannot be used together. Turning on Narrator turns off the zoom function Screen Magnifier. Most of the other drawbacks of Windows phone have already been mentioned for group 2 (zoom users not using the screenreader). The screen reader Narrator itself seems actually quite robust. The virtual keyboard supports typing by split-tapping as well as double tapping and also has a touch typing setting. However, the implementation seems still half-baked: some elements in Windows Phone OS (search) and elements in some of the default apps tested, especially the calendar, were not screen reader accessible. For detailed results covering the thirteen categories of our test, please refer to the separate page Phablets for low-vision and long-sighted users - the details.